Our 2018 Art Camp for Teens was almost completely sold out! We’re opening more spots for teens this summer because we know it will be just as popular. Teens ages 13+ will gain an in-depth studio art experience that engages their creativity and enhances their skills. Each week teens will concentrate on two focus areas during their studio sessions. Small class size enables our talented teaching artists to take a deep dive with teens to build their techniques and individual styles. On Fridays, celebrate your teen’s creations during our culminating art exhibition from 2-3PM. Discover paper’s potential as a sculpture medium. Explore various techniques to transform paper into a pliable, workable medium for creating sculptures. Using recyclable paper, teens will learn to sculpt, carve, shape, and create papier-mâché with this ubiquitous material. Teens will start with a concept drawing and work with the instructor to develop their vision! Take your observational drawing skills to the next level! Teens will draw directly from a life portrait model, focusing on the features of the human face. 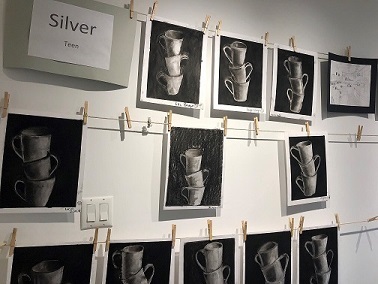 This camp will explore light and shading, allowing teens to gain a better understanding of the facial structure through demonstration and drawing exercises. Art Center Members at the dual/family level and above qualify for members-only tuition rate on this camp!